Hanne Enemark graduated with her Masters degree from the Royal College of Art 2010 and holds a BA degree from Bornholm, Glass and Ceramics School. She has represented Denmark in the Emerging Artist category at the European Glass Context and in 2012 she won Elle Decoration’s New Designer of the Year Award. Hanne is also regularly a guest lecturer at art schools, including at the Royal College of Art and the Glass and Ceramics School on Bornholm. 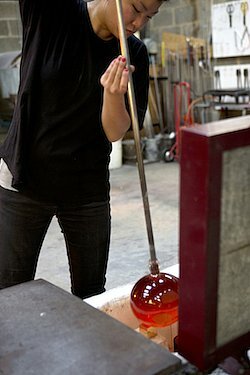 In 2014 she was invited together with Louis Thompson, as guest artists at The Artist in Residency program at the Museum of Glass, Tacoma, USA. She has worked with glass artists in Denmark, France and the UK and her work regularly features in magazines such as Elle Decoration, Wallpaper magazine and Financial Times. Hanne’s work is represented by galleries in both London and New York. Her work is exhibited internationally and can be found in private collections in Denmark, UK, Spain, France, Monaco and the USA. One of her pieces is part of the permanent Collection at Ebeltoft Glass Museum. Hanne is a founding member of Studio Manifold, a collaborative studio of glass and ceramic artists. Hanne currently lives and work in London.